Carrying case specially designed for 10-hole harmonica. 3 separating slots for storing 3pcs harmonicas. Water-resistant material with shock-proof inside design, giving the best protection to your harmonicas. 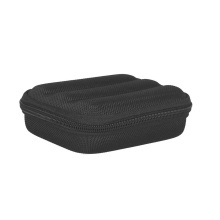 Zippered design and compact size, safe and convenient to carry. The harmonicas showed in the picture are not included.